Senator Jeff Edler and his wife, Stephanie, have been married since 1998 and live on a farm north of State Center. They are the parents of six beautiful children: Wyatt, Whitney, Sienna, Elizabeth, Aubrey, and last but certainly not least, Sawyer. 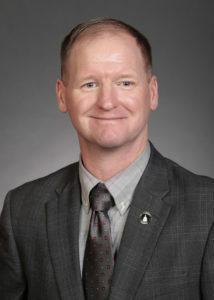 Senator Edler graduated from West Marshall High School in State Center and Iowa State University where he received a Bachelor of Science in Agriculture Studies. He has also attended workshops and classes sponsored by the National Rural Electric Cooperative Association (NRECA) and the Iowa Association of Electric Cooperatives (IAEC). These classes focused on fiduciary, governance, strategic planning, and accountability skills. Senator Edler is self-employed as a farmer and partner with his brother, Justin Edler. He has farmed with his brother since 1996. Senator Edler served as director on the Consumers Energy Board of Directors from 2006-2018, where he had resided as president of the Board of Directors from 2010-2016. Senator Edler was elected to the Iowa Senate in 2016. He enjoys spending time with his family and working on the farm. He is also an honorary member of the State Center Fire Department, St. Joseph’s Catholic Church in State Center and is a member of the National Rifle Association (NRA).